If Google's Gmail service is your primary email platform, you can use it as a central hub to manage other popular accounts as well. I'm using it for sending and receiving emails from Microsoft's Outlook and AOL mail service. The entire setup process is quite simple and is a one-time exercise. Once configured, your Gmail account not only periodically checks for new emails from these external accounts but also allows you to send emails from these external email addresses directly from within your Gmail inbox. Outgoing emails have no indication that they've been originated from a Gmail inbox. 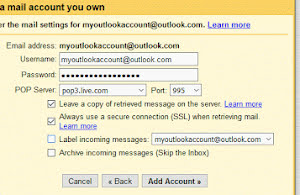 But, you have to make sure that whenever you change the password of your AOL or Outlook accounts, you have to reconfigure the settings within your Gmail inbox as well. It's one of the best strategies to save your time when you have to maintain multiple inboxes. So, open your Gmail account and get ready to tame all the three email platforms from within a single Gmail inbox. Credentials of both the accounts are required. I'm assuming you have a functional and active email account for both the services. We'll configure both sending and receiving emails through a step-by-step process. As I mentioned earlier, you'll need login credentials for these accounts to ensure the configuration is completed successfully. So, let's first configure automated retrieval of emails for both these accounts. Step 1: Open you Gmail account and go to 'Settings → Accounts and Import → Check mail from other accounts (using POP3):' option. Click the 'Add a POP3 mail account you own' option within this section. Step 2: Upon the clicking the option mentioned in step 1, a dialogue box will open prompting you to enter an email address as shown below. Enter your Outlook email address and click 'Next Step >>' button. Step 3: The next dialogue window will ask for the account password. Gmail automatically selects the right POP3 server settings as shown below. Simply, enter the password and check the first option to let the original email copy sustain your Outlook account as well. Step 4: Finally, click the 'Add Account >>' option to complete the automated retrieval of emails from your Outlook account. Step 5: If you're using a custom AOL email address, here's how you can configure automated email retrieval. Follow step 1 and 2 and type your custom AOL email address in the relevant field as already shown above in step 2. Step 6: Whether you enter a classic AOL email address or a custom domain email address supported by AOL service, Gmail smartly detects the same and configure the right POP3 server settings as shown below. Enter the account password and make sure both the checkboxes are selected before adding your email account. Once, both the accounts have been added, you'll get a screen something like this as shown below. As you can see in the image above, Gmail checks for new emails every 60 minutes. If you want to check the emails at a given time instead of waiting for the automated one-hour cycle, click the 'Check mail now' option as indicated by the red arrow in the image above. Clicking this option will instantly trigger the email retrieval process and if a new email has arrived in your Outlook or AOL account, it will be pulled in your Gmail inbox quickly. And now it's time to configure easy sending of emails using AOL and Outlook servers right from within a Gmail inbox. As I mentioned before, the receiving end will have no idea about the actual origin of the email (Gmail inbox). We'll first start with AOL email sending configuration. Step 1: Once inside your Gmail inbox, go to 'Settings → Accounts and Import → Send mail as:' option. Step 2: Once in this section, click the 'Add another email address you own' option. Activating this option will open a dialogue box asking for the email address as shown below. Enter your AOL email address and uncheck the 'Treat as an alias' option. Unchecking it is very important to make sure you do not miss it. Step 3: Now click the 'Next Step >>' option to open the SMTP server settings screen for AOL as shown below. Step 4: Enter your account's password and click the 'Add Account >>' option to complete the process. Step 1: Follow the step 1 and 2 of AOL email configuration process explained above. Step 2: After clicking the 'Next Step >>' button, you'll get a dialogue box as shown below. Step 3: Select the second radio button option to ensure all the emails are sent through Outlook SMTP servers. Thereafter, enter your Outlook account's password and click the 'Add Account >>' button to complete the process. Once the configuration for both the email accounts has been completed, you can use them at will, whenever required. Now, whenever you compose an email, you'll get a drop-down menu for the 'From' field to choose one of the configured email addresses as shown below. You can select the desired email address from the drop-down menu and can send an email using the SMTP server of the respective email platform. The receiving end will not be able to detect (unless you're a techie) the actual origin of the email. Retrieving and sending emails to external email platforms is very much possible within a Gmail account. All, you need to do is to configure the necessary settings to kick-start the process. After completing the configuration, you can also create filters to apply specific labels to incoming or outgoing emails associated with a specific Outlook and AOL account. This can help you segregate them easily on an automated basis. If you're leaving a copy of all the emails on the parent server, make sure you log-in to the respective account every 3 or 4 months to clean your Outlook or AOL inbox. So, that completes the simple and easy process of managing emails of your Outlook and AOL email accounts right from within your Gmail account.